Crossbow and a bow are not the same. Not even close. Their construction methods are completely different. A bow would be made of bamboo and animal sinew, held together by animal glue. It is much harder to make, and since the glues can soften in humidity, need to be stored when not in use. A crossbow is made from wood, with the trigger mechanism --- a very precise job during that time, see the corner of this picture --- is metal. You misunderstand me. a crossbow is a part of the bow family, i don't mean that they are the same. just like a reflex bow or a compound bow is a part of the bow family. like a Chinese is a Human being, but a Human may not necessarily be Chinese. A cross bow is a type of bow and it is sematics, is a dao a knife/sabre and a jain a sword? its where you choose to define what it is and we are very comfortable calling a sabre a sword in this discussion, so why not a crossbow as a bow? Crossbow fires bolts, not arrows. 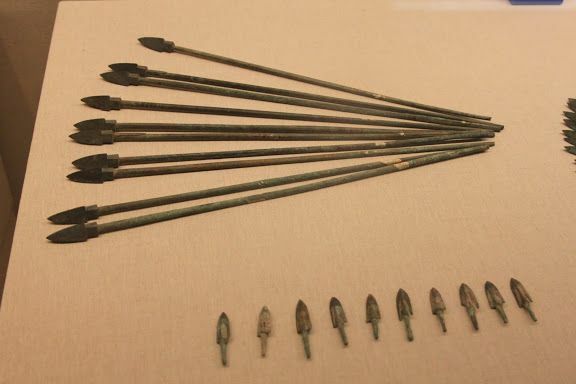 An arrow consists of a metal arrowhead on a wooden shaft. A crossbow bolt is one solid piece of metal. These bolts would have to be mass produced from a cast. Then you have the training to use a crossbow. An archer is one that is trained by growing up as one since childhood. Crossbow uses, you can use farmers and train them to use it in weeks. That allows you to have a lot of crossbowmen versus archers. These descriptions are not completely correct. Romans for example, should be divided into different eras. Early Roman Republic vs. Late Roman Empire is very different, to start with, in their armor. Cylindrical shields only appeared from a certain period of Roman history, they started with circular shields. 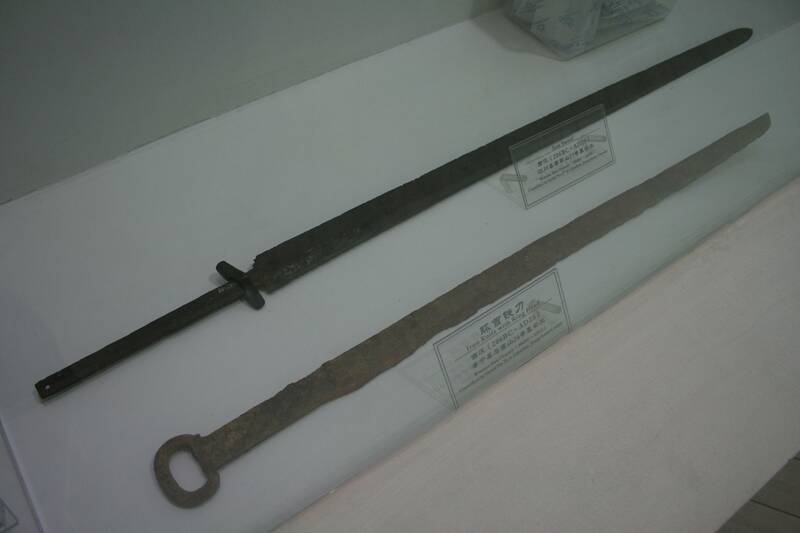 Zhou doesn't use iron sword, they use bronze jian. Animal hide and helmet? By the time of the Spring Autumn period, Warring States and the Qin, Chinese were using lamellar armor, that is bronze plates that are woven into a matrix, over layers of leather and cloth. Lamellar armor is the best armor pre-BC ancients had, period. 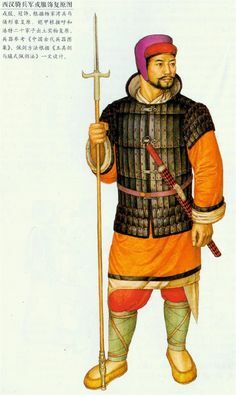 Of course, lamellar armor would only get better in later dynasties, where the count of the plates would go up from 800 to 2000 plates by the late Tan Dynasty. Ofcourse iron rusts away and bronze is more inert so we have more historical artifacts that are bronze. Ancient Chinese used shields. There is also evidence of the use of pikes, and phalanx formations, with equivalents to Sarissa. This is from the Terracota army. The impression that Chinese don't use shields is that of the later dynasties, because lamellar body armor is so effective and thick, shields grew smaller and smaller over time till they are discarded. Chinese armor grew thicker and thicker but something happened to cause them to grow thinner. That was already at the time when the Song were confronting the Mongols. As the Mongols were often skirmishers, having voluminous body armor proved ineffective as it often slows you down. At this point on, its about mobility and speed. Except that Chinese swords were typically longer. By the time of the Tang Dynasty, Chinese dao were like 5' in length. These swords are not carried on the hip but on the back. These are not your secondary weapons. They are quite numerous by the Song Dynasty as required formations. Even a Song Emperor personally intervened in the design process for a new sword to deal with the heavy cavalry of the Jin and the Liao. These northern kingdoms were using Cataphracts that are heavily covered by lamellar armor in addition to the rider bodies themselves, and are impervious to all Chinese weapons, even crossbows. The result is the Zhanmadao, and the Song had special formations of very brave men to handle it. Now as for "swinging" the long sword. Typically, long swords are also used like lances. As for cavalry lancers, the problem of that if the lance sticks through its victim, its going to get stuck, and the violence of such will also take the rider down. Hence why the northern cavalry typically uses sabers, curved ones at the end --- the design would later influence Chinese Dao in later periods, as well as Middle Eastern swords. What you didn't get as a fact that Qin -> Han saw a shift from using bronze to iron to steel in a mass fashion. That's the archeological evidence behind it. The lamellar armor for example, shifted from using bronze plates to iron or steel plates. The Ge, which used to be made in bronze, shifted to steel. By the late Han Dynasty, the steel Dao, in the two handed form with the ring dowel, is the prominent CQC weapon, replacing the bronze jian. Since samples of these swords are found all over, these swords are not likely to be rare. The point is, Chinese infantry were not just armed with a single weapon and that swords are a secondary weapon to the other equipment they are wielding be it pole arms, bows, etc. This is consistent with all ancient cultures. this is back to the discussion of how long a sword needs to last and it needs to last the battle or campaign. That does not look like an iron sword, looks more like brass or bronze to me. It doesn't even look ancient Chinese. But who knows, it could be as a lot of things ancient Chinese are a surprise, since there are Han Dynasty swords that had hand guard likes late European sabers. 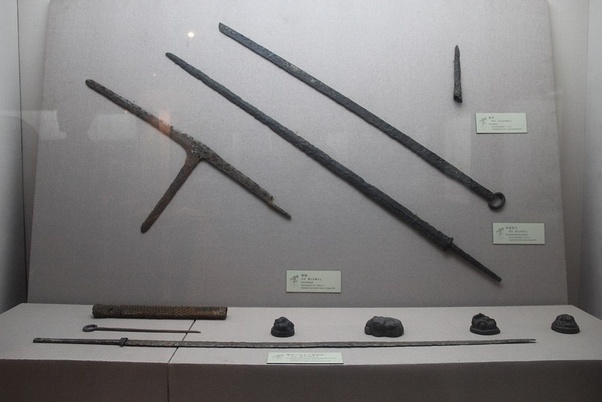 Left is iron jian, middle and right are bronze jians, Zhou period. They represent more or less how Chinese swords would look like, minus fittings that would have rotted away. Unlike short swords, which can be carried as secondary weapons, long swords are used as primary weapon. To have to both primary and secondary weapon is a matter of affordability. Many times no secondary weapon is carried due to cost. There were huge leaps in metallurgy during the Zhou period, then the Warring States, the Qin to the Han, and this is reflected by the length of the swords. 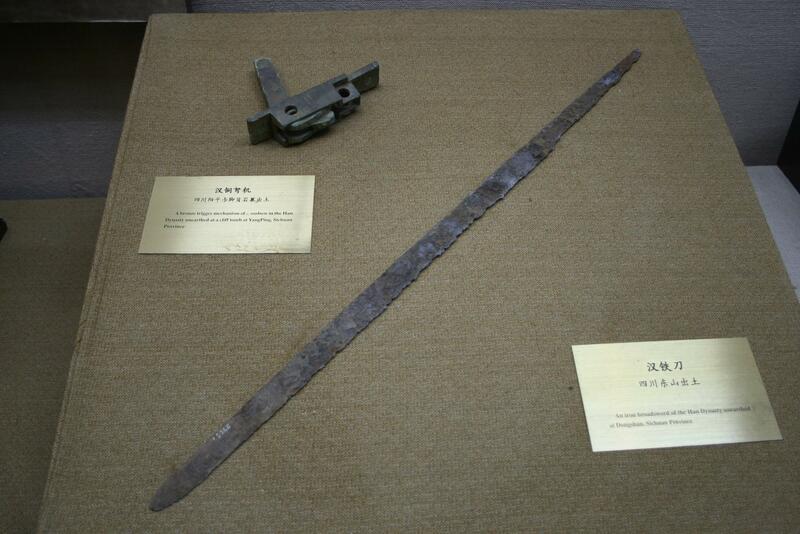 There are many ancient Chinese swords that are freakishly long, longest excavated was around 1.6 meters long, with historical records of up to 1.72 meters long. Where as one point, Chinese soldiers had shields and shorter one handed swords, then came these long swords that were two handed. Originally these were jian, but as time goes on, the long swords became single edged dao. Despite how these swords look, even in their present condition, they are bendable and flexible. These do not look like the sword is a secondary weapon to me. Note the shields being carried. Last picture is a Miao Dao user, in the Ming Dynasty. tam, rust pattern is indicative of iron based metal. so it is an iron sword. this is from a maio dao training manual, doesn't mean much as the dude is not wearing armor as you can see too which is fine for training but not for battle. Note the secondary short sword that was also carried. The statement is not that there are no sword primary weapon units, but they are the minority, the majority of sword use is secondary. I don't see the Ming cavalry carrying any primary weapon don't you? Spear on horseback is used mainly for throwing. If you are still holding your spear on horseback when you stab the spear on your enemy, the spear will be impaled with the victim and as he falls, you will fall with it if you fail to release the weapon. That's why spear is thrown and is only used once. The better term for spear is first use disposable weapon as opposed to primary as in main weapon which will give you the wrong impression. You are going to have to use the sword for the rest of the combat as the sword is capable of repeated use. Note for cavalry, you best use the saber, and your main motion of melee is hacking and slashing, as stabbing can bring yourself down if the sword is impaled on the enemy. That's why horse riders use curved sabers. The Romans are not going beat Greek Sarissa users if you are only using Pilum. Pila are mainly used for throwing but the Romans engage melee combat using mainly scotum and gladius. Another group that uses sword mostly were the Celts. Both Gladius and Spatha are not native to the Romans, but were introduced to the Romans as Celts drafted to the Roman Army brought their swords with them. Going back to the ancient Chinese, dagger axe and ji users use two hands to hold their pole arms. These are separate from units with soldiers that wield both jian and shields, similar to Romans with gladius and scutum. Shield and short sword work in synergy with its each other, though both Romans and Chinese would later discard shields as swords grew longer, as the longer spatha replaced gladius and both dao and jian grew longer. Again, take note. Soldiers that are dedicated to wielding pole arms, and soldiers that are dedicated to wielding sword and shield. 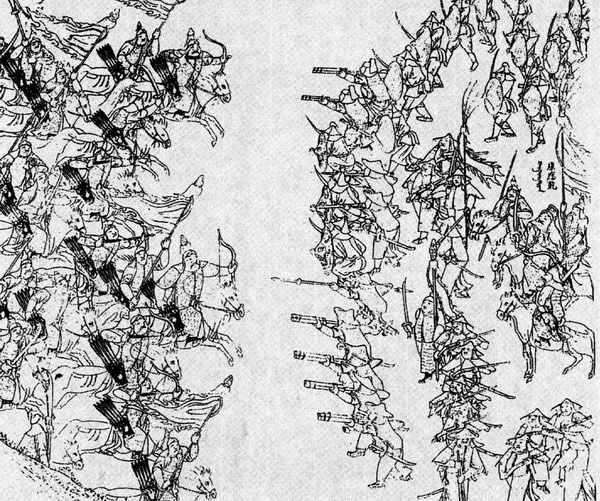 Primary weapon for the ming mounted troops is the bow. you can see the quiver they have on their horses. they will deplete the quiver before switching to swords, logically you won't go into a melee first then switch to ranged weapons. Similarly, the mogols, manchus, all depleted their quivers before moving onto sabers; or english longbowman similarly depelts their arrows before moving to melee weapons -> generally an axe. I guess it is how you choose to define primary weapons and I did not say that the sword wasn't used at all as primary weapon. To me, the first weapon you use is the primary one, which will be mostly missile weapons. My only argument was that sword users as a primary weapon is a minority which is not to say that they did not exist. The Dacian used the double handed falx against the romans at around 100 AD and the guals are famous for their great swords; the statement is only that swords are extremely uncommon on the battlefield and studies have shown that the Dacians and Gaulish warriers, and the Norseman all famous for their great swords are armed only ~10% with swords. And spears are not meant to be thrown, javelins are meant to be thrown. the medieval lancer does not throw his lance, he breaks it upon the wall of infantry and hopefully impaling several men. Triarii whom were older men, and carried spears. So basically of a republic roman army of say 5000 men would be 80% spear and javalin armed, with only the Hastati armed with gladius. So really it was a spear army vs. a spear army. Even Julius Ceaser's legions technically used their Pilum as spears against Vercingetorix and his gauls, it is well documented. Actually you're looking at the northern nomadic horse riders that are in the employ and serve the Ming. 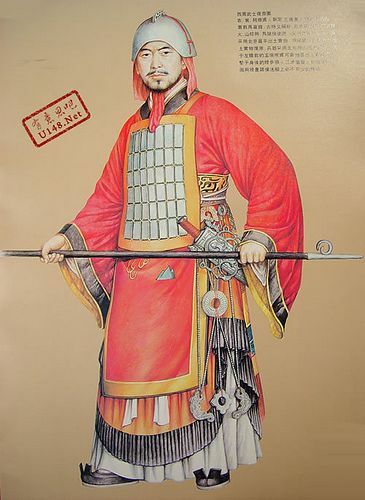 The Han generally serve as infantry, with crossbow, or long pudao or zhanmadao. Even during the Qing Dynasty afterwards, ethnic Han serve in the Green Banner that are purely infantry formation, with crossbow, musket, pike, pudao or zhanmadao. But those that carry great swords are not carrying those swords for backup, but as their main weapon. You don't carry a pole arm that requires two hands, with a long sword that also requires two hands. Numbers don't matter as much if the sword users represent the elite of the force. Of course, its much cheaper to mass produce spears as opposed to swords, which is why you can arm more with pole arms. Not to mention that peasants used in combat use pole arms that dual the use as farming implements. The falx is derived from a sickle, which is used by peasants for harvesting and cutting grass. While the dori is not meant to be thrown, it is still often thrown. That's kind of impaling is a myth. The victim of the impalement would instinctively grab and hold on to the lance, and the rider would get flung over from his horse, breaking his neck. If you are trying to impale an infantry man with a shield, if the shield is set at an angle, the lance would bounce off and crack. Nonetheless, Romans fought the Greeks melee not with pila, as the shortness of the pila versus the Greek Sarissa would put the Romans a deep fundamental disadvantage. The Roman would have use his scutum, and the gladius to parry away the sarissa. To deal with "barbarians", the Romans preferred using the sword, since it was much easier to deal with less than armored opponents that are faster moving. Heavy infantry consists the bulk of an army, skirmishers consist of the minority. The early Roman spearmen led to the later Gladius and Spatha users, after encountering Celts with the effectiveness of their swords. Both the Gladius and the Spatha were not of Roman origin but of Celtic; the Romans not only adopted these weapons, but also Celts that became Legionaires brought their own swords. The spear would be thrown like a missile, but when melee combat is joined, it would be the scutum and the gladius. You failed to get back to the evidence of the ancient Chinese in both illustration and in formation, as per the Terracota army. The polearm user is a separate soldier from the one that wields the spear and the sword. The Ge or Ji user does not carry a shield nor the sword; he already has his hands full with the pole arm. The Greeks often carried a second spear or dori for their secondary weapons. Not only that, but the dory has a metal end on the other side of the pole. If the dory is broken the soldier can still use the other half of the weapon, or use both halves of the broken spear. As for the Japanese bushi, the second sword or wakizashi, isn't used commonly as a backup weapon as it was as a suicide weapon. Also if the second sword is shorter, the shorter sword is used for indoor fighting, not as a backup if the longer sword is broken. Another thing you have to remember that if a samurai enters a noble's house, he has to leave his katana outside, but the shorter sword, the wakizashi, can be allowed to be carried in.